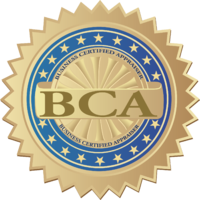 ISBA Provides To Professionals Who Want To Value A Small to Main Street Business A Membership Level Leading To The Professional Credential Of BCA (Business Certified Appraiser). A key focus of the ISBA in its Membership Levels is to provide the professional with the training, service, and support they need to excel. ISBA promotes the best practices and exemplary standards. Our standards also follow and uphold Standards 9 & 10 of USPAP (Uniform Standards of Professional Practice). Therefore, you can rely with confidence on the ethics and reporting standards required by lenders, CPAs, attorneys, courts, and others. What Sets The ISBA And The BCA Professional Credential Apart From The Others? About our focus – leaving no business valuation professional behind. That means you have a direct hotline to others who hold sterling credentials that can help you when you need it. You won't have to wait until it is convenient for someone to contact you. About our benefits –.we provide tools to be used today.